In his speech after Tuesday’s election, Donald Trump referred to America’s “forgotten men and women” who propelled him to victory. They are the blue-collar workers in the manufacturing towns of the Rust Belt and the hollowing coalfields of Appalachia. These people feel left behind by progress, laughed at by the elite, so they put their faith in the billionaire businessman who promised to Make America Great Again. In any event, VEEP-elect Mike Pence is a Keynesian now who supports Trump’s $1 trillion of spending on infrastructure. So is Steve Moore, one of the founders of supply-side economics. He recently declared himself to be a populist now. (1) Exhibit A against China. 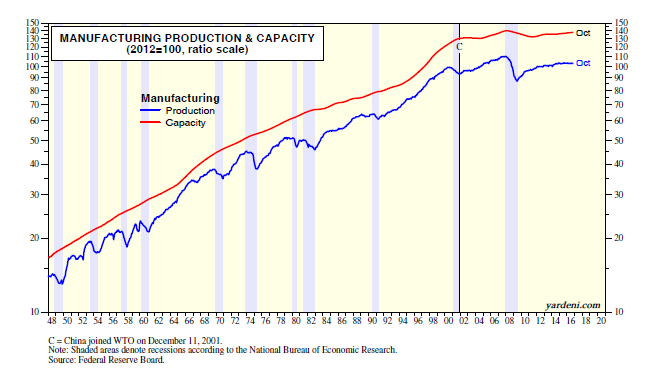 In researching the causes of the productivity slowdown during the current economic expansion, I ran a chart of the Fed’s indexes for manufacturing industrial production and capacity. They both are available monthly since the late 1940s. Both have been on uptrends since the start of the data until about 2001, when both started moving sideways. China entered the World Trade Organization (WTO) on December 11, 2001. While manufacturing production reflects the ups and downs of the business cycle, manufacturing capacity has a long history of relatively stable growth. In fact, on a year-over-year basis, the former tends to turn negative, while the latter had remained positive until it turned slightly negative for the first time from September 2003 to October 2004, and again from August 2008 to November 2011. Capacity growth averaged 3.9% from 1949 through 2001. From 2002 through 2015, it averaged just 0.4%. If we were all populists now, I would argue that this is Exhibit A confirming that US companies stopped expanding their capacity in America ever since China entered the WTO. Instead, they invested in factories in China or outsourced to Chinese factories to produce goods that now are imported into the US rather than made here by American workers. (2) Smacking productivity. If we were all populists now, I would challenge the argument made by Globalists that Americans have lost jobs as a result of labor-saving technological innovations, rather than the migration of jobs to Chinese workers. I would counter that this notion isn’t supported by the flat trends in manufacturing production and capacity since 2001. Technological innovation should expand manufacturing capacity and boost labor productivity. Yet nonfarm business productivity growth has been extremely weak during the current economic expansion. Over the past 20 quarters (five years), it is up only 0.7% per year on average. It has never been this weak during an economic expansion! Not surprisingly, there does seem to be a good correlation between the growth in manufacturing capacity on a y/y basis and the five-year growth trend in productivity. The latter tends to grow fastest during or soon after a period of fast growth in capacity. This makes sense to us. 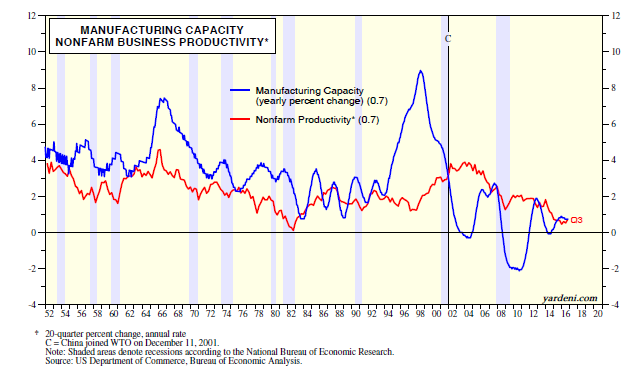 If companies aren’t expanding capacity at home, then domestic productivity is likely to suffer. (3) Whacking real incomes. If we were all populists now, I would also note that productivity drives the standard of living, which by some measures seems to have stagnated for years. That jibes with the high correlation between the 20-quarter growth rates in productivity and real hourly compensation in the nonfarm business sector. The latter is up just 1.0% per year on average, among the slowest five-year growth rates since the start of the data in the early 1950s. (4) Blaming foreigners. If we were all populists now, I would support the view that free trade hasn’t been fair trade by observing that our merchandise trade deficit was $724 billion over the past 12 months through September. That is below its record high of $851 billion during October 2008. However, excluding the petroleum trade deficit, which has narrowed dramatically in recent years, the merchandise deficit, at $670 billion over the past 12 months through September, remains near recent record highs. Now let’s round up the usual suspects. Over the past 12 months through September, our trade deficit has been as follows among our major trading partners: China ($350 billion), Eurozone ($128 billion), Japan ($69 billion), and Mexico ($63 billion). In terms of product categories, the US is running merchandise trade deficits over the same period in autos ($199 billion), non-auto capital goods ($69 billion), and non-auto consumer goods ($389 billion). China currently accounts for 48% of the US trade deficit. Mexico accounts for just 9% of it. (5) The case for Globalization. At the risk of getting tar and feathered by the populists, allow me to make the case for Globalization. (These are my own views, so my associates at YRI should be held harmless.) For starters, the US quarterly balance-of-payments accounts show that the US trade deficit in goods, which was $751 billion over the four quarters through Q2-2016, was partially offset by a sizable trade surplus in services of $251 billion. In any event, the horses may already be out of the barn. Only 8.5% of payroll employment is now attributable to manufacturing, down from 10.3% 10 years ago, 14.3% 20 years ago, and 17.5% 30 years ago. Bringing factory jobs back to the US may bring them back to automated factories loaded with robots. Even Chinese factories are using more robots. The standard of living hasn’t stagnated in the US. That notion has been promoted by the President-elect, and other populists, who have observed that real median household income has been virtually flat since 1999, though it did jump 5.2% during 2015. Previously on several occasions, I questioned the accuracy of this data series, which is based on survey (micro) data, is limited to money income, is pre-tax, and is pre-noncash entitlements. Macro data based on tax returns and other fact-based sources, on real personal income, disposable personal income, and consumption per household all remain on rising trends and are at record highs. While my data are averages (means) rather than medians, I doubt that there are enough rich people to seriously distort my numbers, especially for real mean consumer spending per household. The main argument for free trade is that it lowers prices for consumers since imported products must be cheaper to make overseas than at home. Everyone is a consumer, so everyone benefits from lower prices. Studies have shown that it would be much cheaper to provide income support and retrain workers who have been harmed by Globalization than to impose prohibitive tariffs to force production to come home, thus reducing the standard of living of all consumers, who must pay higher prices for domestically produced goods. Business Insider published an article on 11/27 that was titled “Here’s what 5 of your favorite products would cost if they were made in the US.” The price of iPhones could more than double. Jeans would cost more than $200. The price of sneakers might also double. TV prices might not go up much since transportation costs would be lower for domestically produced units, but solar panel prices would be much higher. The election results clearly show that there are many people who feel that they have been harmed by Globalization. They may not realize that they have also benefitted from it through lower prices on the goods they purchase. It is unlikely that prohibitive tariffs will bring back manufacturing jobs paying much higher wages. Those days are probably gone. The best hope is that Globalization increases incomes, consumption, and standards of living around the world, thus leveling trade imbalances. Trumponomics is a mix of demand-side and supply-side economics. The former tends to be inflationary, while the latter tends to be disinflationary. That’s in theory. In practice, we will all find out together what the net result of mixing things up like this will do to inflation. On the demand side, President-elect Trump proposes to spend $1 trillion on infrastructure over the next 10 years. On the supply side, he proposes to slash the corporate tax rate. He also intends to reduce income tax rates on personal incomes, which can have both inflationary demand-side and disinflationary supply-side effects. I think that on balance, the disinflationary supply-side effects will offset some, but not all, of the inflationary demand-side effects of Trumponomics. That certainly should greatly reduce the risk and fears of deflation. If so, then the 35-year bull market in bonds might have ended on July 8 of this year when the 10-year yield bottomed at a record low of 1.37%. It is already back up to 2.23%. Protectionism can be inflationary, as long as it doesn’t trigger a depression, which would be deflationary. The Smoot-Hawley Tariff of June 1930 caused a depression and a collapse in commodity and consumer prices. I recently have observed that the Reagan administration pursued policies that seemed protectionist at the time. Our major trading partners were pressed to adopt fairer trade practices in exchange for free trade with the US. The US economy continued to grow, and inflation remained subdued. I think that will be the outcome of the current protectionist wave. So I expect that Globalization will survive the latest challenges. Specifically, he said that job gains of as low as 65,000 to 115,000 would be “sufficient to maintain full employment.” Even if participation rates were to remain unchanged, Fischer said a range of 125,000 to 175,000 job gains would prevent “unemployment from creeping up.” Nonfarm private payroll employment gains averaged 210,200 per month over the past five months through October. The unemployment rate has been around 5% since last fall. Strong labor market indicators were also evident in the latest Job Openings and Labor Turnover Survey (JOLTS) and National Federation of Independent Business (NFIB) reports through September and October, respectively. According to both surveys, the rate of job openings exceeds levels during two of the past three cyclical peaks. Layoffs fell to the lowest on record, while quits were near a record high during September. Not surprisingly, quits are highly correlated with the Consumer Confidence Index, which has been lagging but could jump higher now that the elections are over. This all points to higher wage inflation. The Atlanta Fed’s median wage growth tracker shows that “job switchers” enjoyed a wage gain of 4.4% y/y during October versus 3.6% for “job stayers”. Average hourly earnings for all private industry workers rose 2.8% y/y during October, the highest since June 2009. (3) The dollar, oil, and other commodities. The soaring dollar and falling oil prices should help to moderate inflationary pressures in the labor market. The JP Morgan trade-weighted dollar is now up 24% from its low on July 1, 2014. That, along with OPEC’s inability to agree on production cuts, is depressing the price of oil. Trump’s commitment to “lift the restriction” on the US energy industry could very well drown the cartel in oil. On the other hand, the CRB raw industrials spot price index is soaring. However, it is doing so as the dollar is doing the same, which is unprecedented. It is also extraordinary to see that inflationary expectations have jumped since the election, while the dollar has soared. In any event, the strong dollar is bound to put downward pressure on nonpetroleum import prices. (4) Productivity. Over the past couple of years, there has been a widening consensus that secular stagnation is here to stay. I’ve been there too. Keynesian economists, like Larry Summers and Stanley Fischer, have argued that the only way out is more fiscal spending. Supply-siders have championed less government and tax cuts as the only sure way to revive growth. I’ve sided with the latter camp. Now Trump is proposing to do all of the above. If he succeeds in boosting real economic growth, it might not be inflationary if it is based on productivity. I have argued that productivity has a demand side as well as a supply side. The productivity of the most efficient widgets factory in the world will be zero if demand for widgets is zero. Better economic growth could very well prove that the supply side of productivity can deliver more output, thus limiting inflation. Monday was a happy day, with the S&P 500 rising 2.2%, breaking the previous nine-day losing streak. The market continued to advance on Tuesday (Election Day) and again on Wednesday. The financial press said that Monday’s action reflected increasing odds that Hillary Clinton would be the next President. Wednesday’s action meant that the market was looking forward to Donald Trump in the White House. Or maybe investors are just relieved that the election is over. In any event, the latest relief rally also reflects lots of recent good economic news that hadn’t been discounted because of the political uncertainties hanging over the market as the elections approached. The latest earnings data are mostly happy news. Once again, we are seeing a happy hook in Q3’s blended earnings of actual and estimated results for the S&P 500. It has increased by $1.28 per share over the past three weeks to $31.00 during the 11/3 week. There’s also a significant upward hook for the S&P 400, while the S&P 600 continues to flat-line near the lows for the quarter. So now the Q3 earnings growth rate for the S&P 500, which was slightly negative at the start of the earnings season, is plus 3.3%. The growth rates for the S&P 400 and S&P 600 currently are 5.0% and 6.7%. US Economy: Full of Beans? In the movie “Casablanca,” Humphrey Bogart tells Ingrid Bergman, “Ilsa, I’m no good at being noble, but it doesn’t take much to see that the problems of three little people don’t amount to a hill of beans in this crazy world.” Apparently, the US exported a hill of soybeans during Q3. A surge in soybean exports after a poor soy harvest in Argentina and Brazil helped to shrink the US trade deficit during the quarter, boosting real GDP growth. (1) Government is no longer a drag. From mid-2010 through mid-2014, real GDP excluding federal, state, and local government spending rose mostly around 3.0% on a y/y basis. However, since Q4-2015, real GDP growth has been below 2.0% with and without government spending. In other words, government spending has stopped weighing on growth over the past year. (2) Energy recession is over. Of course, the biggest drag on growth since the second half of 2014 has been the recession in the oil patch. Real GDP spending on mining exploration, shafts, and wells structures plummeted 67% from Q4-2014 through Q3 of this year. This is very similar to the plunge in the mid-1980s, when the oil business fell into a recession yet the overall economy continued to grow. This series is highly correlated with the US rig count, which seems to have bottomed at the beginning of this year. The energy recession also depressed demand for trucks and railcars to transport fracking materials and crude oil. That has been reflected in the 10% y/y drop in real outlays on transportation equipment. This category of capital equipment had soared to record highs over the previous few years. While there may be more downside in this series, it was encouraging to see sales of medium-weight and heavy-weight truck sales rebound sharply during September. Meanwhile, the energy recession hasn’t depressed capital spending elsewhere. Real spending on industrial equipment, information processing equipment, software, and R&D all edged up, remaining in record-high territory during Q3. (3) Obamacare may be weighing on consumers. Consumer-spending growth slowed from 4.3% (q/q saar) during Q2 to 2.1% during Q3. This series, which is also available monthly, showed a solid y/y gain of 2.6% during August. However, that was down from a recent peak of 4.0% during January 2015. An increasing drag on overall consumer spending may be Obamacare. The Affordable Care Act has driven up costs throughout the entire health care system. Out-of-pocket spending on deductibles and copays has risen sharply. Since consumers can’t predict their health care needs, this also creates a great deal of uncertainty and anxiety about how much should be set aside for these increasingly unaffordable out-of-pocket expenses. Another possible drag on consumer spending is that the economy may be at full employment. While job openings are at a record high, finding workers with the skills to fill the openings is getting harder. So employment growth could slow because of a labor shortage. That should, in theory, boost wages, but it hasn’t happened yet. (4) Inventory drag over for now. Real inventory investment has been a negative contributor to real GDP growth for the past five quarters through Q2. During Q3, it contributed 0.61ppt of the quarter’s annualized growth in real GDP. Again, I suspect that the energy recession may have weighed on inventories since mid-2014, when the price of oil took a huge dive. That effect may finally be behind us. (5) More than just a hill of beans. The soybean-driven export growth spurt is likely to reverse in Q4, though exports of capital and consumer goods have been growing strongly in recent months. Overall exports increased 10% (q/q, saar), the biggest rise since Q4-2013. As a result, trade contributed 0.83ppt to GDP growth after adding a mere 0.18ppt in Q2. The strength of the dollar and slow global economic growth suggest there won’t be any more upside surprises in exports anytime soon. (6) Waiting for the Millennials. During one of my meetings in Boston at the end of last week, I was asked what might cause a sustainable upside surprise in real GDP growth. I responded that I am waiting for the Millennials to get married, move to their own homes in the suburbs, and have kids. I may be waiting for a while. There’s some, but not much, evidence that they’ve started to settle down the way the Baby Boomers did. (7) The bottom line. So my central premise is that the slowdown in real GDP growth since mid-2014 was mostly attributable to the energy recession, which seems to be over. If so, then the economy should resume growing at its stall speed of 2% without stalling into a recession.